Interestingly, celebrity chef Pankaj Bhadouria, who won the inaugural season of MasterChef India in 2010, was a teacher of English at Lucknow’s City Montessori School for 16 years before the kitchen came calling. And unwittingly, it was the quote by Professor Higgins, the protagonist of G B Shaw’s Pygmalion, that inspired her to make the transition from literature to the culinary arts. He said, “Happy is a man who can make a living out his hobby.” Undoubtedly, Bhadouria takes pride in being a live example of a lady who has made a living out of hers. The older of the two children of Vinod and Priya Khanna, she was born and raised in Delhi. She has a brother, and is an alumna of Kendriya Vidyalaya and the holder of a master’s degree in English literature. Bhadouria, who lost her father when she was 13 and her mother nine years later, was promoted to teach the senior secondary classes in 1996. 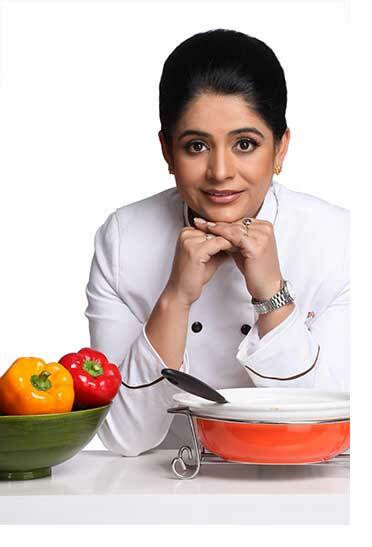 Fourteen years later, she quit her job, because she got an opportunity to participate in MasterChef India. On responding via a text message to an invitation by actor Akshay Kumar, the host and one of the three judges of the reality show, to audition for it, her journey, which was fascinating, commenced. Bhadouria received a call, cracked a telephonic interview and cleared three levels of local auditions before advancing to the final round of auditions, which took place in Mumbai and witnessed the participation of 100 people from across India. The dishes made by her earned kudos from the actor and his co-judges, chefs Ajay Chopra and Kunal Kapur. This earned her an invitation to the boot camp, in which 39 others participated. Bhadouria, who opined that competitions were mental games, was subjected to a great deal of pressure, as were the other participants. But she survived it, sailed through the various tasks, progressed to the top 12 and advanced to the finale. Crediting MasterChef India for being the stepping stone to not only doing something she was passionate about, but also getting paid for it, the former teacher, in fact, sees her culinary career as an extension of her teaching stint. She said that her teaching experience has held her in good stead. In the past, she taught a class of 45, and now she teaches between 400 and four million people, be it as the host of shows (either live or on television) or at workshops. Fortunately, she didn’t face many challenges, because doors opened for her after she won MasterChef India. Besides recognition and acceptance, her TV stint has earned her love and admiration from people, for which she considers herself lucky. Since 2010, she has appeared on a number of other shows, including Kifayati Kitchen, Sales Ka Baazigar and Rasoi and two eponymous shows (Chef Pankaj Ka Zayka and 3 Course with Pankaj). People have walked upto Bhadouria and told her that they enjoyed watching a particular recipe on television and tried it out. She said that their comments were both heartening and deeply satisfying. In addition to winning a number of accolades at the national and international levels, she became the face of several brands. And she has made a successful foray into writing as well, with five best-sellers to her credit. Bhadouria has also authored a book on Indian chicken curry. It had 54 recipes from all over India. Another was a discovery of the cuisine of the northern Indian state of Uttar Pradesh. Her latest book was The Secrets in the Spice Mix. As the title suggests, it celebrates 50 spice mixes from across the country. The essence of Indian cooking, they are regional in nature. Each of them is accompanied by a recipe. When quizzed on her choices of topics for her books, Bhadouria stated that she chose topics that helped her embark on a path of discovery, because that was what excited her. Moreover, she has turned restaurateur with a bistro named Cafe by Default in Lucknow, and three outlets of Tramp Tree Cafe, located in Lucknow and Sitapur. More outlets in other cities are also in the pipeline. And if these accomplishments weren’t enough, Bhadouria established a culinary academy in Lucknow on August 16, 2012. It offers professional and certificate courses to amateur chefs. As a mentor, she has been helping aspiring chefs shape their careers and sharing her passion for cooking with them. The success of the academy isn’t a surprise, and proves that once a teacher, always a teacher. Bhadouria, who considered Cinnamon Caramel Phirni her signature dish, claimed to have learnt the recipe for sambhar from her mother, who, in turn, picked it up from a Tamilian neighbour in Delhi. Commenting on fusion food, she stated that it was just a reflection of the world today, and is a result of the exposure to different cultures of the world through various media. “In the true sense, the world has become global. So food can’t be far behind,” Bhadouria said, citing the global recognition of the power of turmeric and Indians’ use of broccoli and zucchini at restaurants and in their own kitchens as examples. “Science, too, is making its presence felt in the form of molecular gastronomy. As the world evolves, fashion trends will change. And so should food,” Bhadouria stated. She is married with two kids, and her mother-in-law and two dogs complete her family. She enjoys their company, and counts reading, painting, watching movies, listening to music and travelling as her hobbies. Be it her television shows, books, her academy or her restaurants, Bhadouria stated that she is very happy doing what she is doing, adding that she would like to see what life has in store for her in the future.